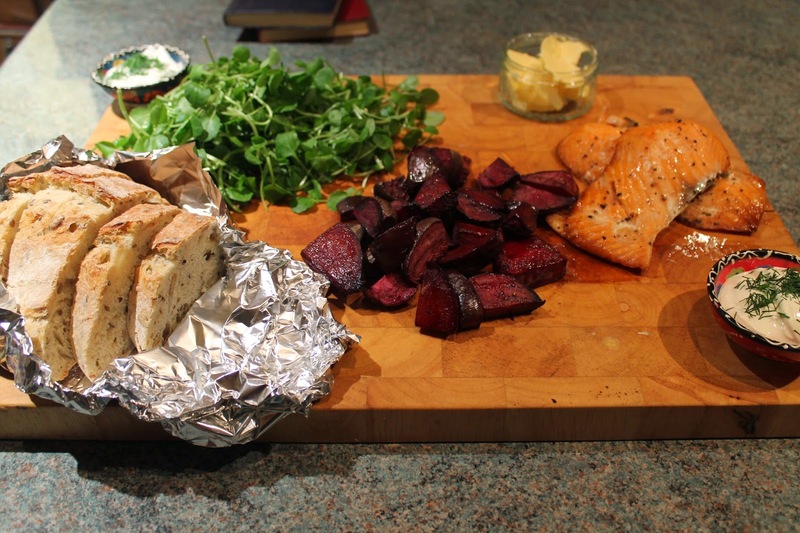 I have unfortunately not been well the last few days – hence my absence from the blog – but I am feeling much better today and was ready for something nourishing and delicious to get rid of the last vestiges of my illness. This is something I always crave when I’m not quite feeling right. The salmon is obviously wonderfully healthy, packed full of protein and healthy oils. The broth contains garlic, ginger, coriander and lemongrass – they also contain lovely, healthy things (I swear by ginger when I’m not well; I’ll chop fresh ginger and have it in a cup of boiling water – try it, it will cure anything). Mix this with noodles and coconut milk and you have a hug in a bowl. Helpfully, the meal is also ready in 15 minutes, so perfect when you are tired. This will serve 2, with extra broth left over. 1. Start by finely chopping the ginger and garlic, and adding it to a large pan over a medium heat with half of the olive oil. 2. When it starts to sizzle, bruise the lemongrass with a knife and add this to the pan, along with the sliced coriander stalks and tamarind paste. Cook, stirring often, for 2 minutes, then add the coconut milk and the same amount again of water. Add the soy sauce, fish sauce and palm sugar. 3. Bring the broth to a simmer then add the sugarsnap peas and noodles. Simmer for 5-7 minutes, while you cook the salmon. 4. To cook the salmon, heat the remaining oil in a frying pan and add the salmon, skin side down. Cook for 5 minutes, until the skin is crisp, then flip over and cook for another 1-2 minutes. 5. Stir the chopped coriander leaves into the broth. 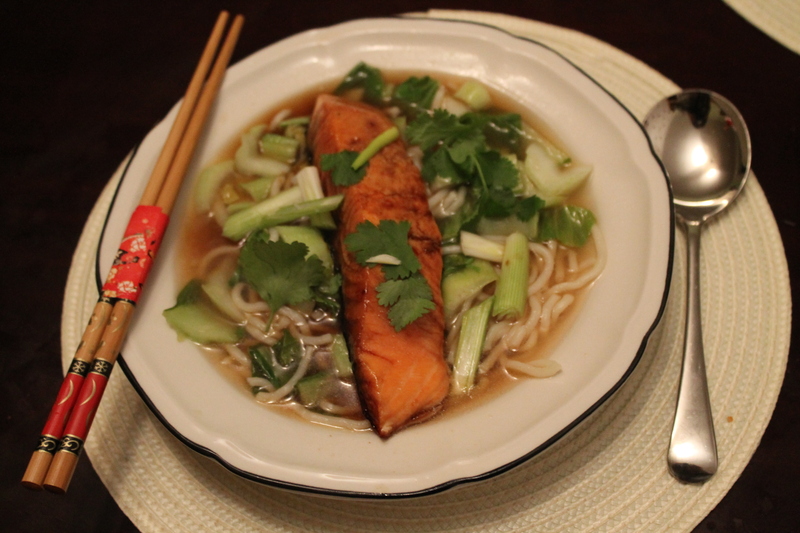 To serve, ladle the broth into bowls and top with the salmon. Sprinkle over some chopped spring onion and peanuts. Enjoy! This is a very simple, and quick (it’s ready in 15 minutes), dish – but it will taste like you’ve spent hours slaving over the stove. 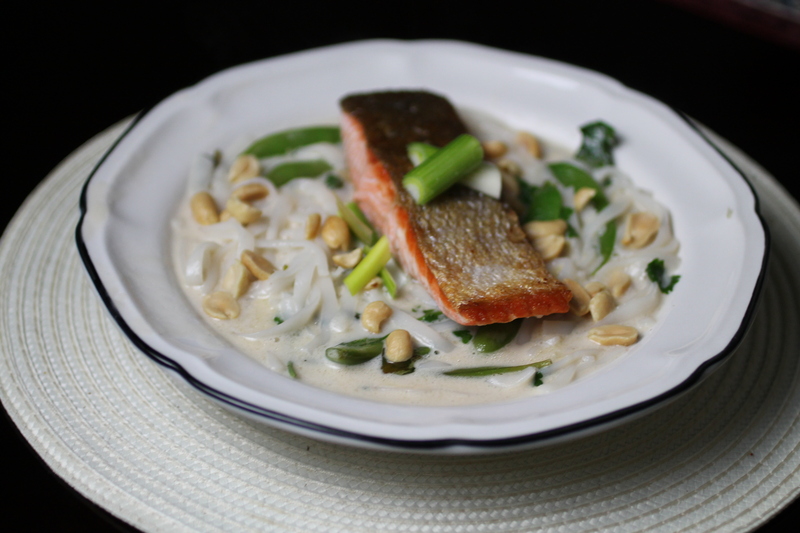 It’s a Japanese inspired dish, and I love the savoury, sweet flavours this recipe has. When you’re cold (we were threatened with snow today, but all we got was misty, relentless ice cold rain, which I would argue is worse), there is nothing better than a warming broth; and miso is such a comforting flavour. Paired with salty, sweet soy glazed salmon (say that after a couple of glasses of wine! 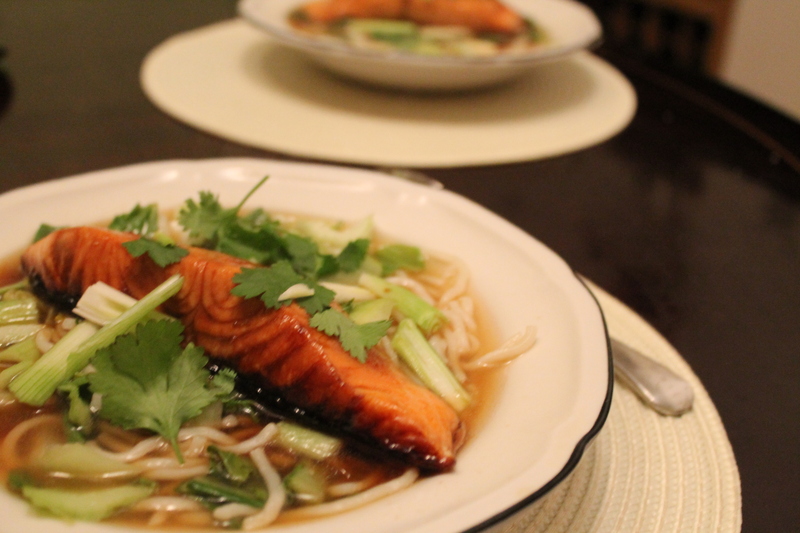 ), where the marinade leaks into the broth, this recipe ticks all of the boxes. Our plates were clean in 5 minutes. The most important things to remember with this dish are 1) don’t overcook the salmon – try to make sure it’s still nice and pink in the middle and 2) don’t panic when the glaze bubbles up and turns black as ink – this is perfectly normal. Remember it’s bound to go like caramel – it has sugar in it – and this is what makes it so delicious. This will serve 2 (with broth left over – I could drink it instead of tea!) and will take 15 mins. 1. For the noodles, heat the miso paste in a large saucepan for 30 seconds, then add the sliced garlic and galangal. Add 1 litre water and bring to the boil, then add the noodles. Simmer for 5 minutes, then add the pak choi. Simmer gently until your fish is cooked. 2. For the glaze, mix the soy sauce, rice vinegar, sugar and sesame oil in a small bowl. Put a non-stick frying pan on a medium heat and add the salmon fillets, skin side down. Cook for 1 minute, until the skin starts to crisp, then pour the glaze over them. Cook for another 5 minutes, then flip and cook for 30 seconds – 1 minutes. 3. 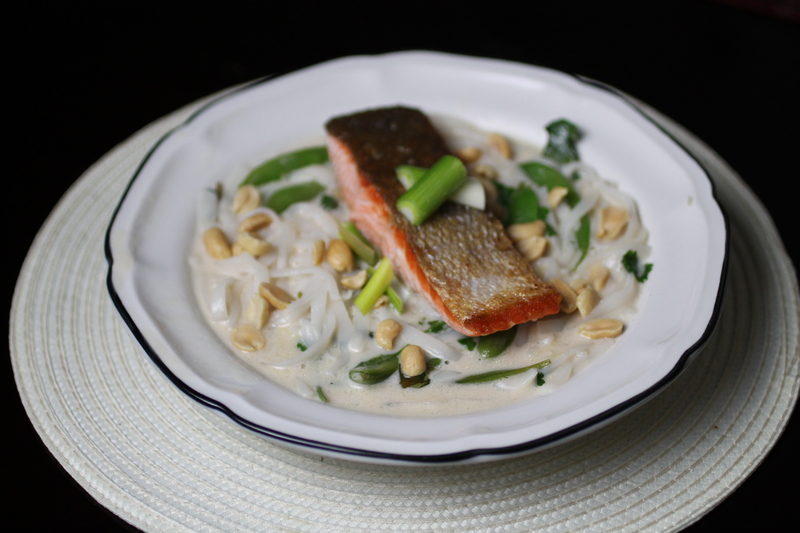 To serve, ladle the noodles into bowls then top with the salmon fillets. Sprinkle over sliced spring onions and coriander leaves, then let your taste buds enjoy a treat!